Monarch Air Group provides private air charter in Bodrum, Turkey. Our clients benefit from top-notch service, unrelenting dedication to safety, wide selection of aircraft, and years of experience in chartering private jets. To obtain a free quote, please use our online quoting tool provided below, or call toll free 1-877-281-3051. Monarch Air Group provides private jet charter flights in and out of Bodrum, Turkey. Located on the southern coast of Bodrum Peninsula, Bodrum is a resort town on the Aegean coast of western Turkey. The population of the city is 118,237 people. The city’s economy is mainly based on tourism. The most popular tourist attractions include Dedeman Aquapark, Kocadon Restaurant, Bodrum Hamam, Boat Tours, Bodrum Marine Club, West Side, and others. 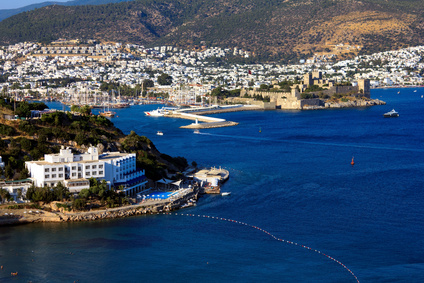 With its beautiful beaches, luxury restaurants, 5 star hotels, vibrant nightlife and plenty of outdoor activities, Bodrum attracts both business and leisure travelers from all over the world. Bodrum is served by Milas-Bodrum Airport (BJV / LTFE), Kalymnos Island National Airport (JKL / LGKY), Kos Island International Airport (KGS / LGKO) and Leros Island National Airport (LRS / LGLE). 1. BJV, Milas Airport, Bodrum, Turkey. 2. BXN, Imsik Airport, Bodrum, Turkey. 3. JTY, Astypalaia, Astypalaia Island, Greece. 4. KGS, Kos Island International Airport, Kos, Greece. 5. LRS, Leros, Leros, Greece. 6. MSK, Mastic Point, Mastic Point, Greece. 7. RHO, Diagoras, Rhodes, Greece. 8. SMI, Samos, Samos, Greece. 1. Azka Hotel, Bardakçı Koyu 26, Bodrum. 2. Azka Hotel, Bardakçı Koyu 26, Bodrum. 3. Azka Hotel, Bardakçı Koyu 26, Bodrum.